Hello everyone! Today I have a really fun and easy project for all of you. I absolutely love Instagram and I capture some pretty awesome moments of my kids and our adventures everyday. The downside to keeping all of these moments in a digital album like Instagram is that a lot of the time we forget to print them out to keep forever! Digital cameras and smart phones have taken place of film cameras and while these devices are really convenient nothing is better than taking film to get developed, flipping through photographs, and creating photo albums or framing all of these great moments. Ah, nostalgia! I love forcing myself to print out my digital photos and find ways to use my Instagram photos in my home so I came up with these fun little Insta-photo magnets! You can stick them on your fridge, filing cabinet at work, or any cold metal surface that can be warmed up with pictures of your kids, cats, or food. This project is quick but the results will make you so happy, we all love a little instant gratification. -Scissors, preferably pink. It makes it more fun. -2x2 Mini canvases, I picked these up at my local craft store. -2x2 Printed Instagram photos, I printed these on Epson Matte Presentation Paper. First off, lay out all of your supplies, using your paper plate as your work space. Cut out each of your Instagram photos and have them ready. Pour a small amount of Mod Podge onto your paper plate and use a paint brush to coat one of your tiny canvases and then stick your photo to it. Make sure that you smooth out the photo so there is no bubbles and make sure you line up your edges the best that you can. Some of the canvases are a little funky on the corners so the white might show a little bit, no worries. Repeat this step until you have all of your photos glued to the canvases and let them dry completely. When they are all set brush a very thin layer of Mod Podge over each of the photos being careful not to glob it on. If you use to much you will smear the ink on your photo! Let these completely dry as well and then turn them over. 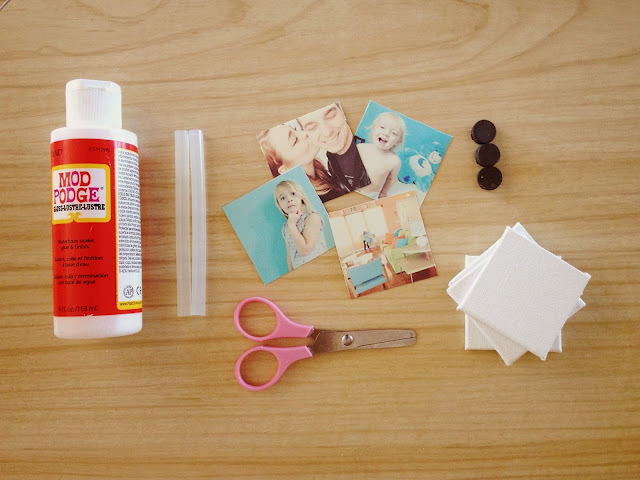 Glue a tiny magnet on the back of each with your hot glue gun and voila! All done! I told you it was super easy! I could see these making very cute gifts for grandparents, everyone knows they love to show off photos of their grand babies! Honestly, they would probably make great gifts for anyone! Make them for your friends, siblings, parents, your neighbor, cat sitter, the guy who delivers your paper...okay maybe I went a little too far! I really love the way that these magnets turned out! They add just the right amount of personality to my kitchen and I smile seeing the littles and their silly faces! Who doesn't love seeing happy little moments from their life when they go to grab a yogurt in the morning? Your are so crafty! Thanks for sharing. 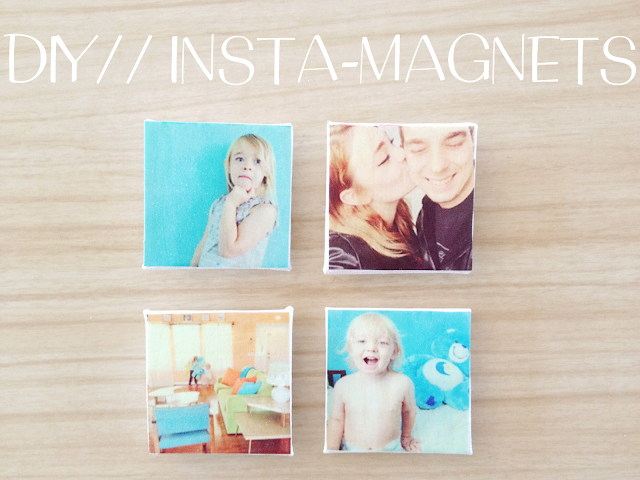 I have been using Snapstagram to print instagram pics and never thought to turn them into magnets. What a great idea, they are too cute.